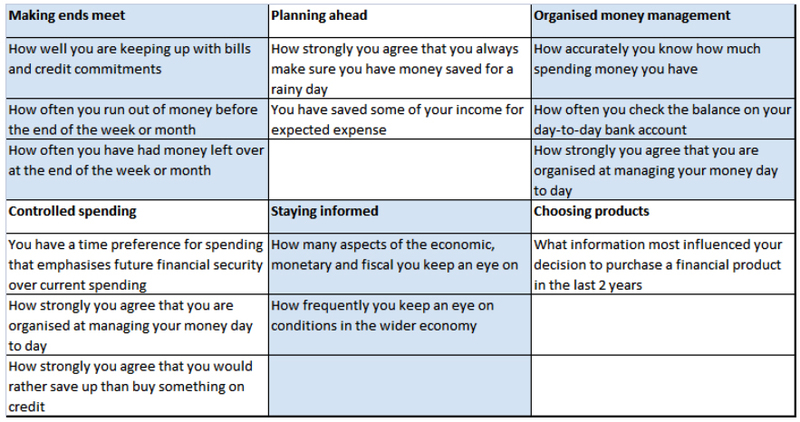 Today we’re going to look at financial capability in the UK, through the lens of three government reports and an opinion poll. 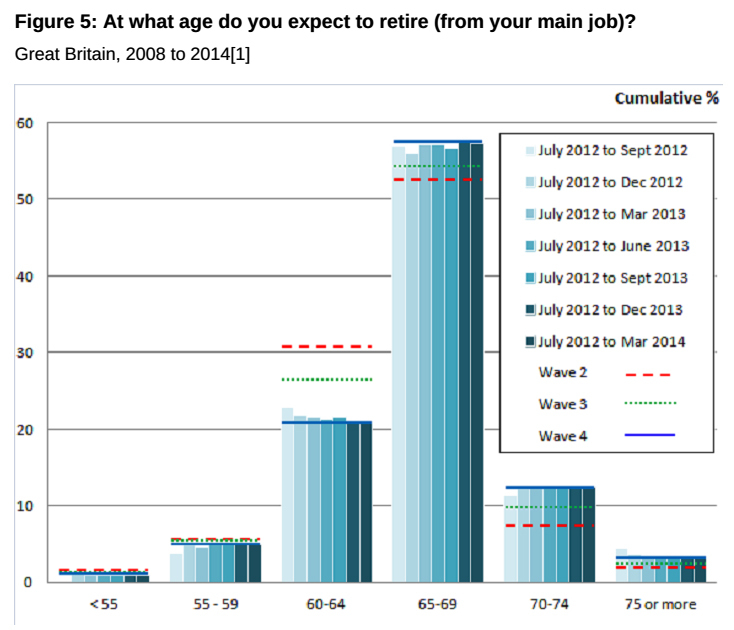 The research was carried out by the University of Bristol from 2010 to 2012, using data from the 3rd edition of the ONS Wealth and Assets survey (of which more later). 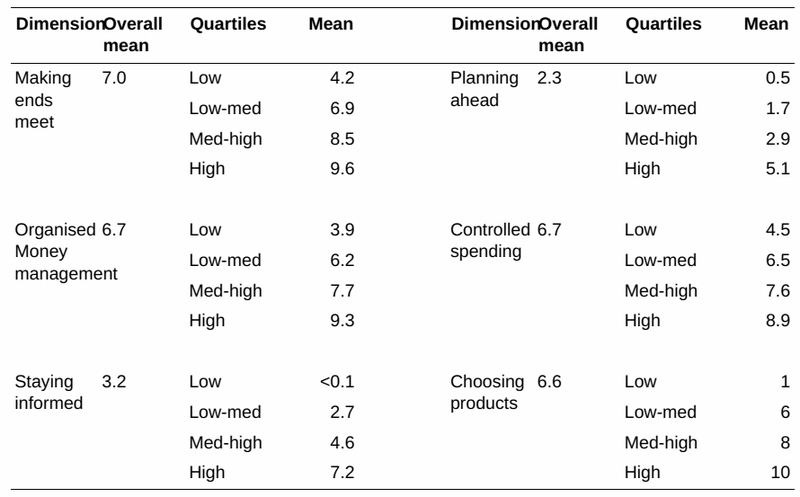 Eighteen measures were mapped on to their underlying dimensions of financial capability, with a focus on behaviours rather than knowledge or skills. 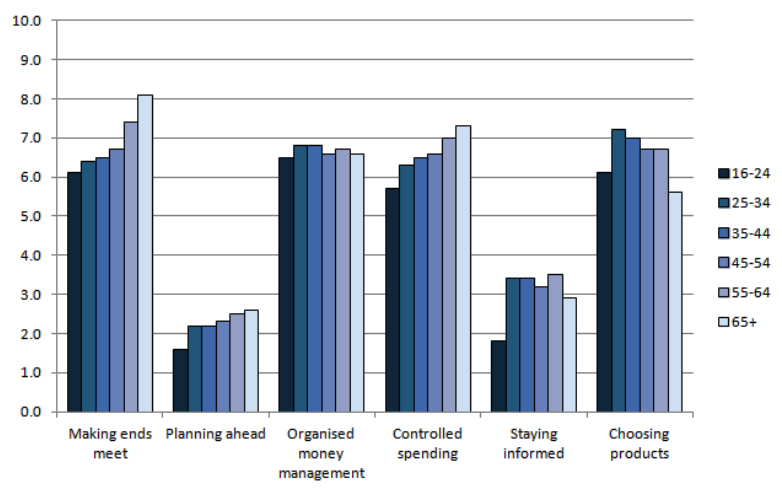 People scored best at making ends meet (7.3) but badly at planning ahead (2.3) and staying informed (3.2). The remaining scored were in the middle of the range. 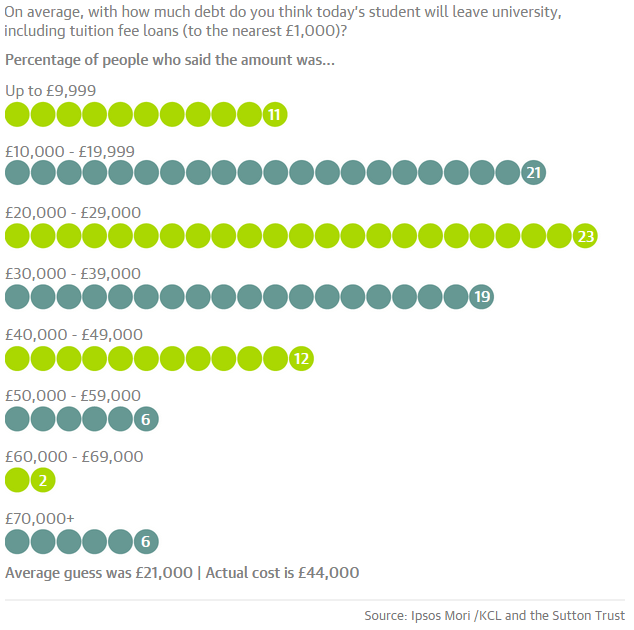 Only 1% of the population was deemed to be financially astute (scored higher than average on all six measures), but 30% had no low scores. More than one in five (22%) did not score highly on any measure, and almost 10% of the population had four or more low scores. These people were more likely to be young, male and poorly educated. 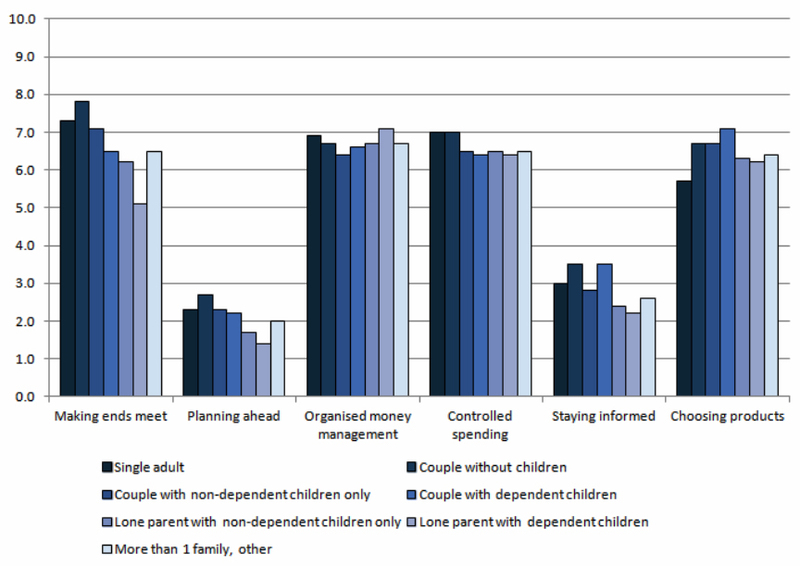 People living in couples with children, and single parents were also over-represented. Scotland, Wales and the East of England were the regions where most of these people lived. Richer people (whether measured by income, wealth, pension size or amount of financial assets) performed better than poorer ones, and the old did better than the young. Couples without children score higher than those with children; lone parents do even worse. 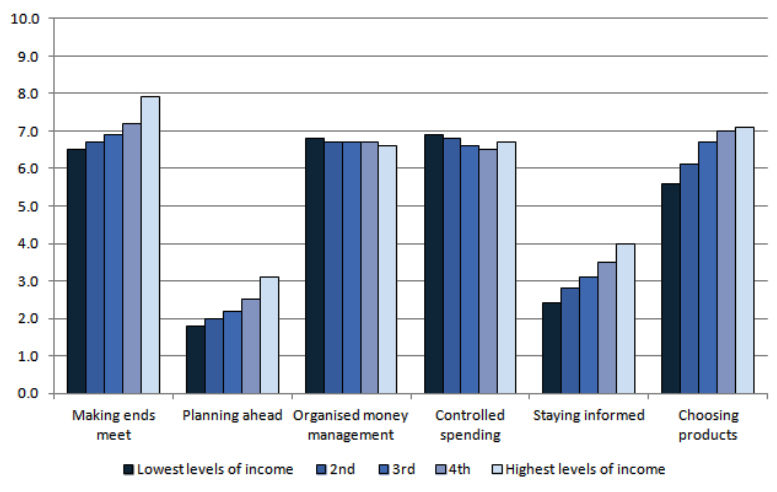 Better educated people also scored more highly, as did those in higher socio-economic groups. The effect of gender is generally small. The exception is staying informed, for which men score better by approximately three-quarters of a point. The report also looked at the correlations between the six measured dimensions. Correlations were positive (someone who was good at one thing was more likely to be good at another) but generally weak. Last month the ONS released preliminary data from the 4th edition of the Wealth and Assets survey, covering 2012 to 2014. 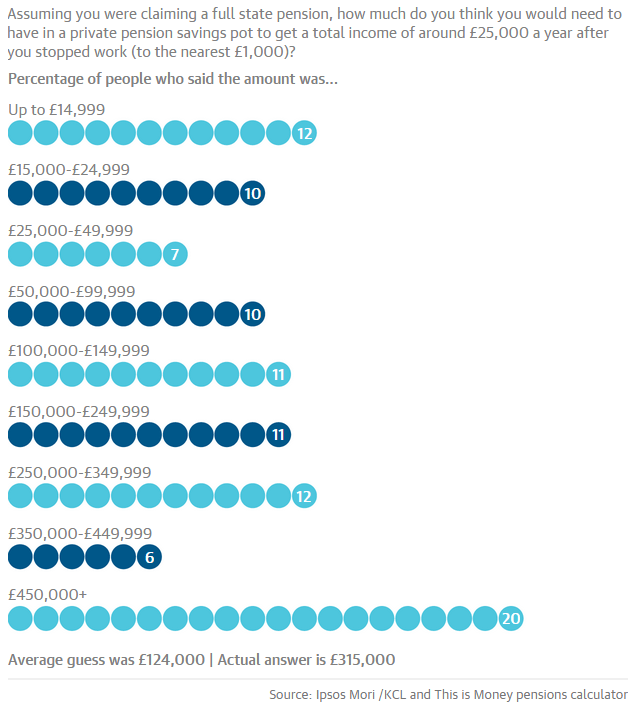 The main reasons for not contributing to a pension were all related to income: can’t afford to, low income, other expenses; this suggests that people are aware of the need to save for retirement, and recognise a pension as the right way to do so. 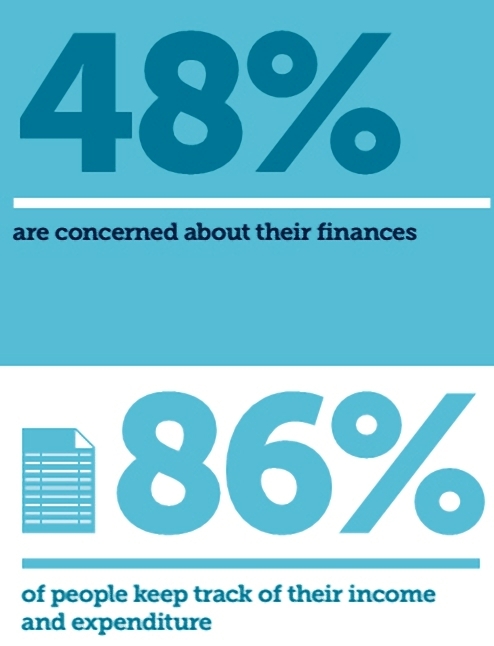 The MAS found that more people were struggling with their finances than in 2006 (up from a third to more than half). Because of this, they focussed more on the here and now than on planning for the future. 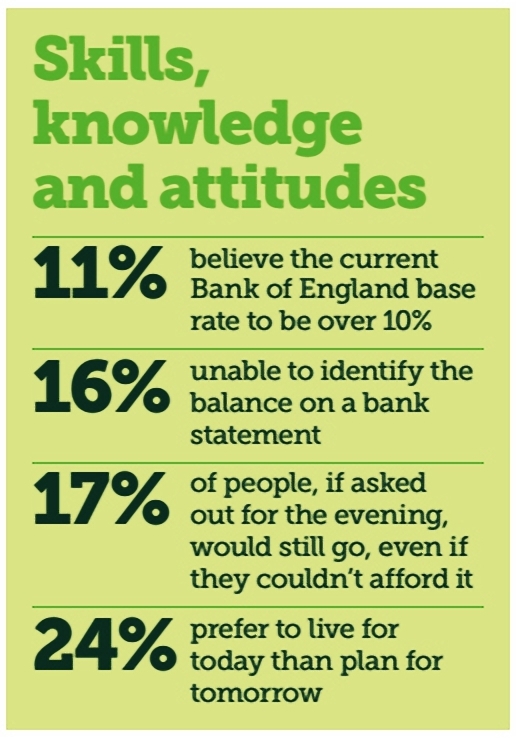 16% of people were unable to identify the available balance on a bank statement. 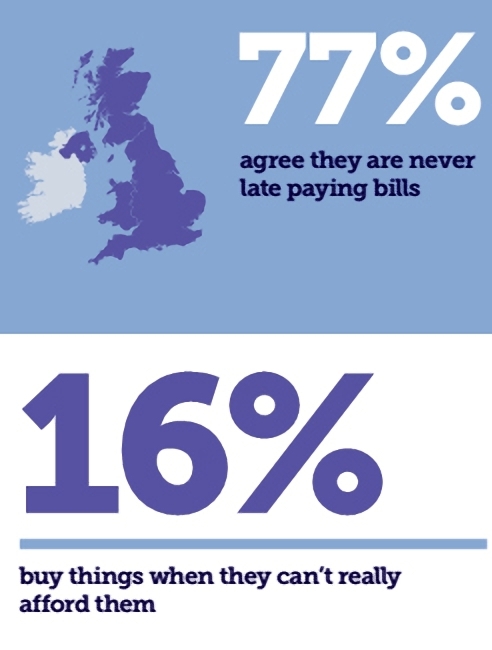 one in five people would rather take £200 now than £400 in two months’ time. 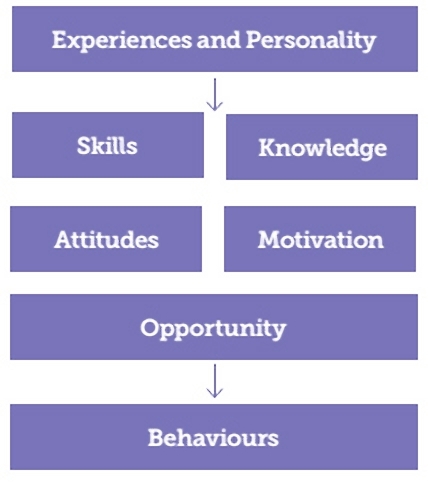 The MAS reported that behavioural sciences research had shown that approaches based only on education and information – to improve knowledge and skills – were not successful in improving financial capability. Decisions were influenced by how options were presented – by ‘framing’ and ‘contextual’ factors. A wide range of skills are needed, including mathematical planning, self-control, decision-making and problem solving. The emotional, cognitive and behavioural capacity to take the correct action is also important. Knowledge is required to act sensibly in the financial arena – closing this gap was the original raison d’être of the MAS, as well as the Citizens Advice Bureau, and more recently, Pensionwise. 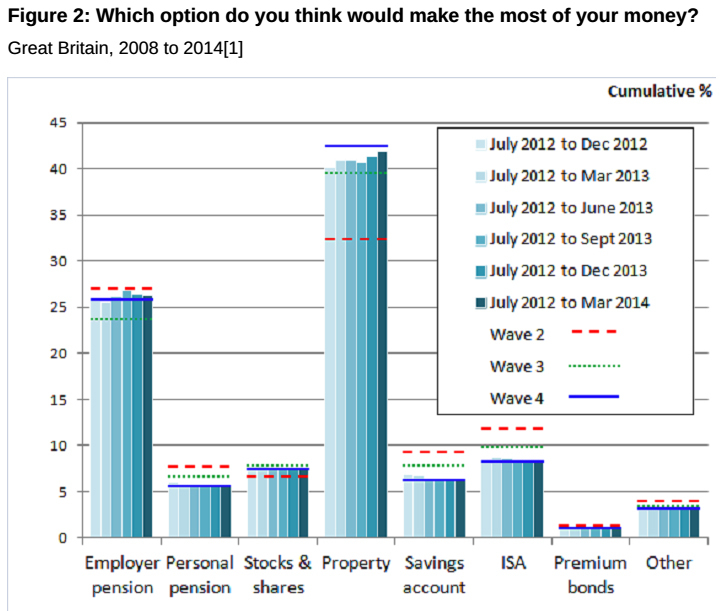 Pensions, inflation and interest rates were not well understood. Attitudes are important and are influenced by peer pressure and social norms – initially by parents’ beliefs, values and habits. ‘Struggling’ families often prioritise pay TV holidays and cigarettes, as well as branded clothes and expensive cars. Parents often want to make sure their children are not ‘different’, and so provide things they can’t really afford. 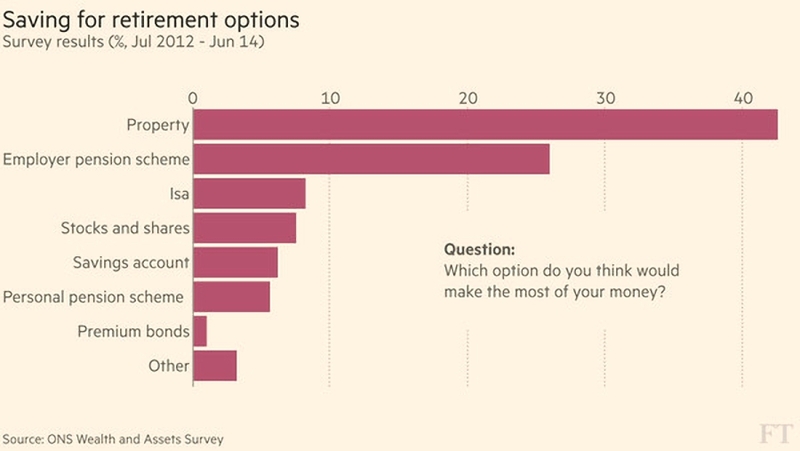 The MAS was not clear on what could be done to change these attitudes. Motivation was found to be a key problem for older families. Those who were 10 to 15 years from retirement had lived through periods of hardship, and saw little motivation to save for the future. Younger families were typically disadvantaged by lack of opportunity (in its widest sense). 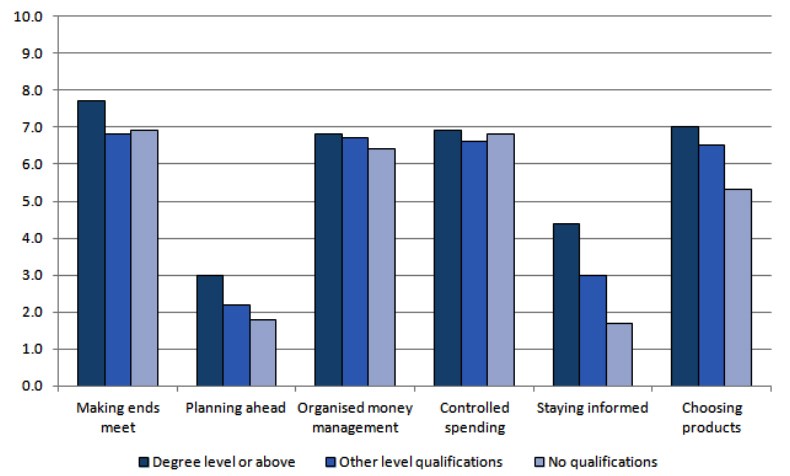 Many had little support for education, and their job market opportunities were limited. Whilst this is a plausible enough model, the MAS report used it in a descriptive rather than prescriptive fashion. 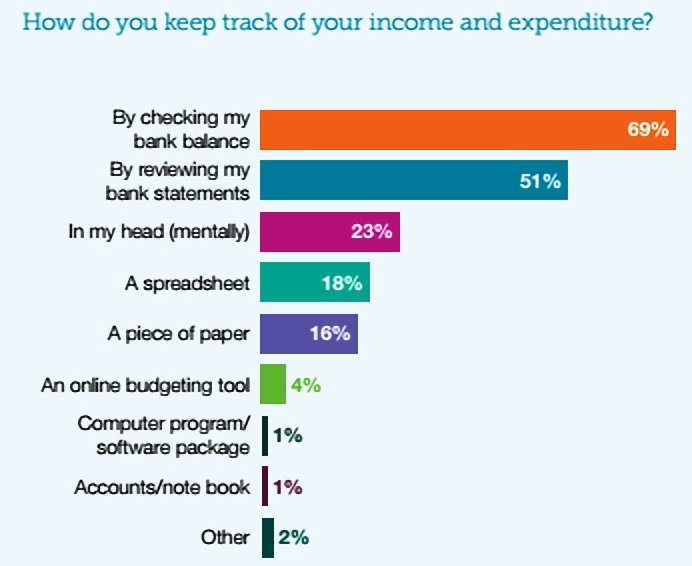 It seems there are lots of reasons why people fail financially, but the MAS had little to say on how to change that. People underestimate how much a lot of things cost. They underestimate how much they need to save for retirement. They think a lot of people earn lots of money, and that those people don’t pay much tax. Only 1% of the population scores highly over six measures of financial capability, though 30% have no low scores. More than one in five people do not score highly on any measure, and almost 10% of the population has four or more low scores. 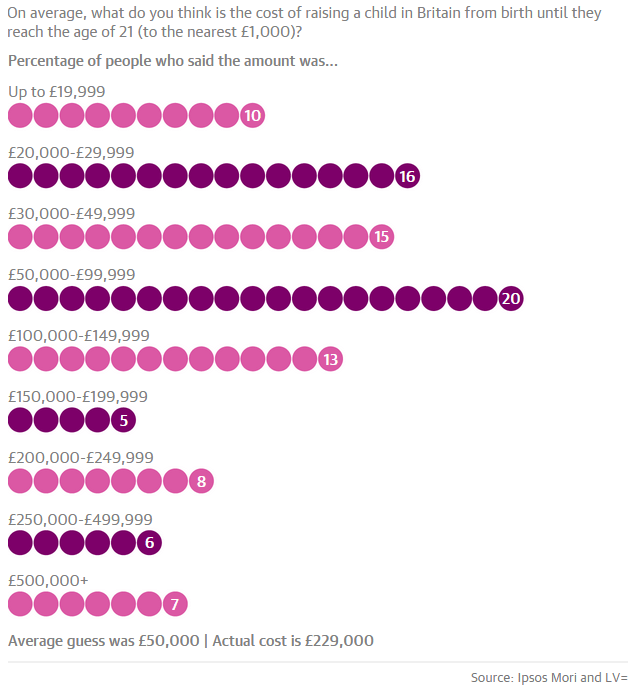 These people were more likely to be young, male, poorly educated, have children, be lone parents and live in Scotland, Wales and the East of England. 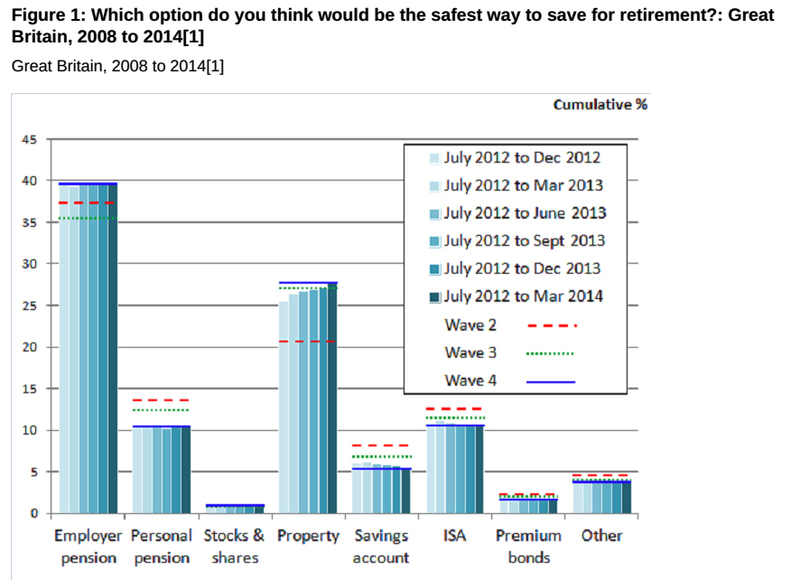 Workplace pensions are beginning to be recognised as a safe way to save for retirement. Property is still seen as the best way to make money. 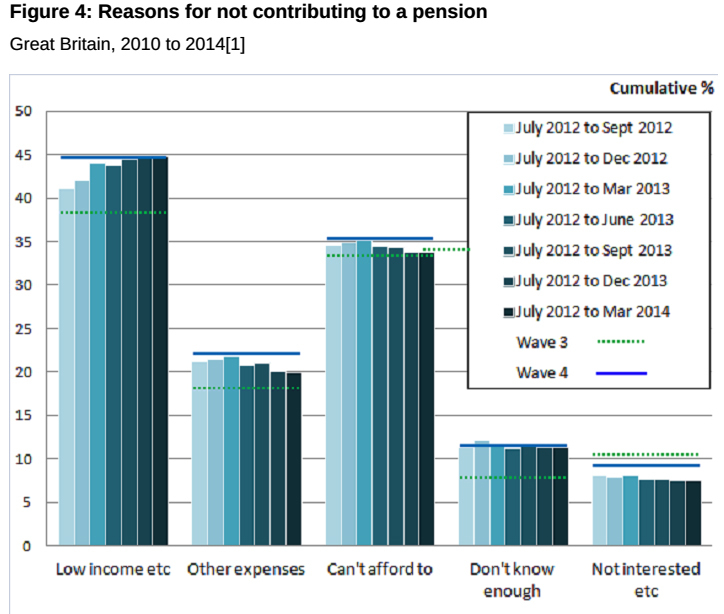 “Not enough money” is the main reason for not contributing to a pension, suggesting that people are aware of the need to save for retirement, and recognise a pension as the right way to do so. Recessions force more people to focus on the here and now, and put off planning for the future. 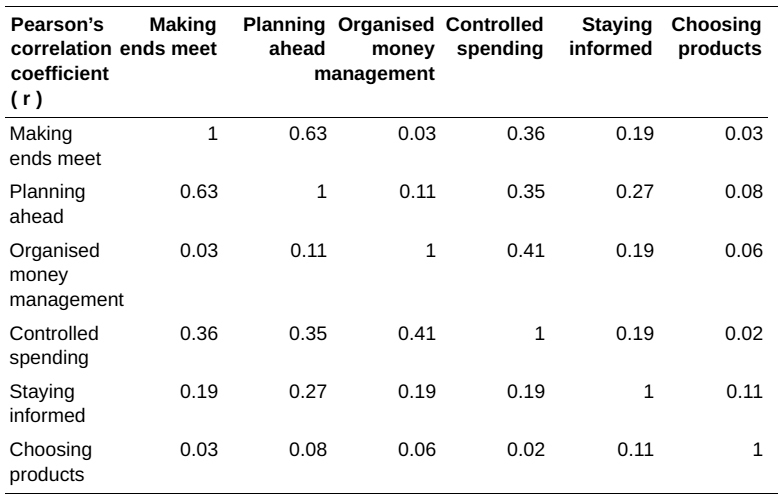 Financial knowledge is simple to provide, and skills can be developed to a certain extent, but the lack of the psychological capacity to act, and the development of the underlying attitudes that allow social norms to be resisted, are less straightforward problems to solve.